Lev Manovich : The flâneur navigates through the flows of passers-by and the city streets, enjoying the density of stimuli and information provided by the modern metropolis. He can intensify his experience of ‘being in the flow’ by choosing particular places and times of days. Augustus : I found Rome a city of bricks and left it a city of marble. SIMAGE : Cities are no longer made of bricks or marble, they are made of images, are image, and they reproduce like images of each other, as if being printed of concrete, steel, and glass. Douglas Rushkoff : Walkman was the precursor to the cell phone, in terms of your strategy for getting through the urban landscape and the modern experience. Insulate yourself from it with your own soundscape. SIMAGE : Cities invade landscapes, landscapes besiege cities, and cities become landscapes. Landscape is frame as city is image. We often use imagery of landscape to think of our cities: jungles, canyons and photos of skyscrapers, and rivers of traffic. 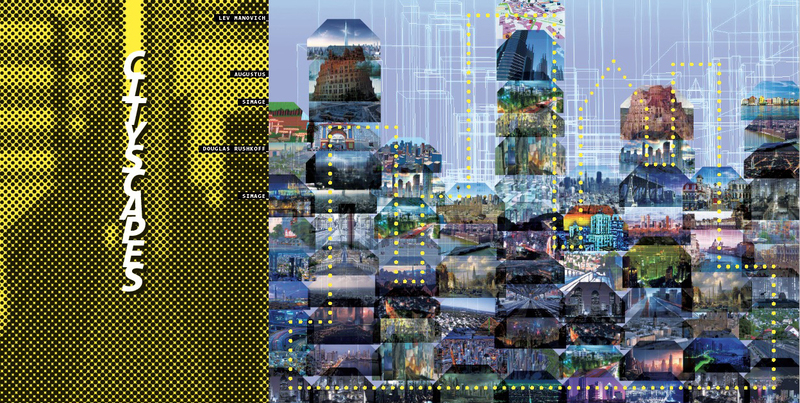 Modern cities are mechanized landscapes and robotic entities. IMPERIAL: Athens—Rome—London—Washington DC, ANCIENT: Byblos—Damascus—Jericho—Balkh—Jerusalem, POPULOUS: Shanghai—Istanbul—Karachi—Mumbai—Moscow, ICONIC: Las Vegas—Venice—San Francisco—Dubai, VIBRANT: Rio—Berlin—Brooklyn—Miami—Bangkok—Lagos, DANGEROUS: San Pedro Sula—Juárez—Cali—Medellín-—Detroit, PHOTOGRAPHED: New York—Barcelona—Venice—Havana—Florence, POOR: Port Au Prince—Neza Chalco Itza—Kibera—Dharavi, and FUTURISTIC: Tokyo—Hong Kong—Toronto—Sydney—Masdar.